The weather in Brisbane has turned quite summery these past few weeks and gone are the cool nights when my little kitty kat sought out a warm lap to curl up in. Instead she has now taken to spreading herself out as far as she can on the tiled floor to cool off. Who can blame her - she hasn't shed her winter coat yet! So it's not unusual for her to lay on the studio floor in wait for fallen beads to skate crazily across it. 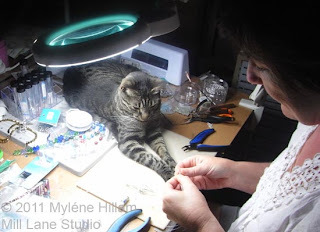 Chasing beads is one of her favourite past-times but tonight she reckons there wasn't enough action down there so she joined me on the beading table where she could create a little bit of mischief and "accidentally" knock a few beads on to the floor. Gotta love the way kitty kat thinks! After a few minutes excitement she joined me back on the table..... intently watching what I was doing. And then she lay down her head on her paws and had a nap. Impossible! How are you supposed to work around that?!! Oh..... it's a cat's life! After "nail polishing" the handmade paper beads in yesterday's post, it's now time to see how they look when they're combined with more conventional beads. I've got to say I am pretty pleased with the way the beads work together and I'm even more pleased with how well this piece sits when worn. 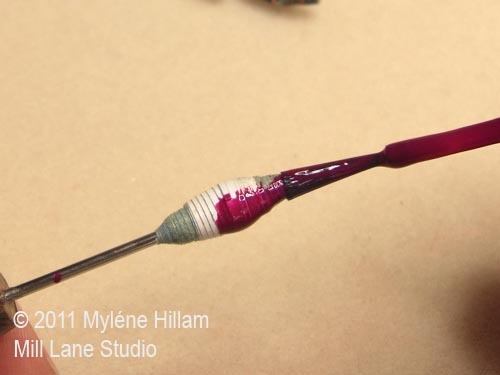 I ended up using two different shades of nail polish: the gorgeous burgundy colour you saw me paint with in yesterday's tutorial and also a mica filled silver. 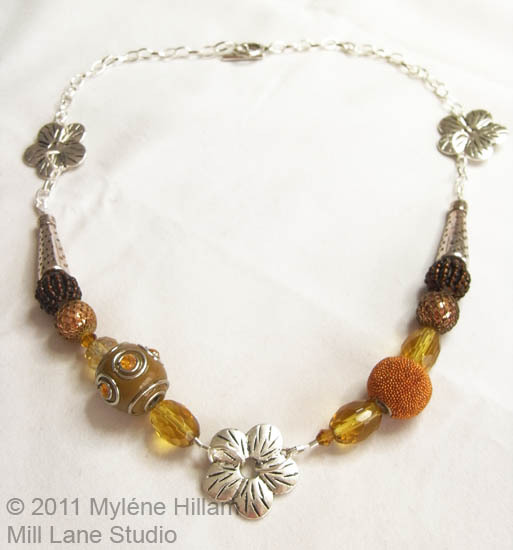 The silver is almost transparent so whilst you see the beautiful glimmer from the mica, you also get to see the magazine print on the beads. It's an interesting look. 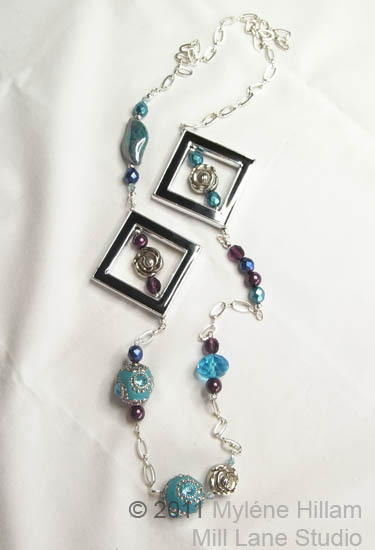 I also left some of the beads uncoloured because they coordinated well with the aquamarine Kashmiri beads I've used in this piece. You can just see one at the top of this image.... sorry I cut the rest of it off! 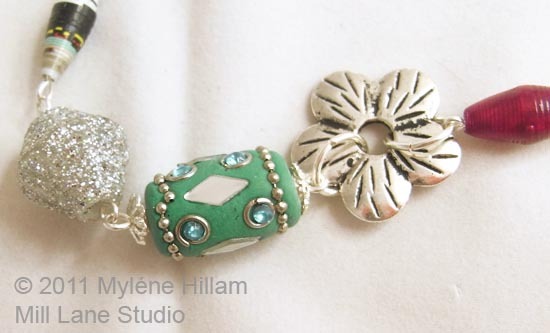 I love the daisy spacers connecting the beads together. There are no holes in them though so I had to get creative to attach them. 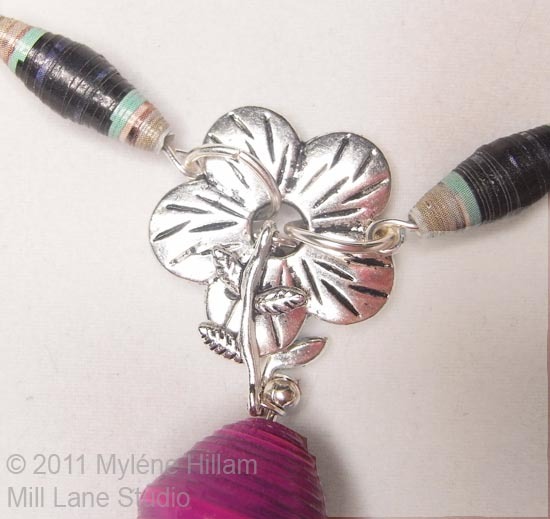 Large oval shaped jump rings worked well for the body of the necklace but the challenge was really in how to attach the focal magenta paper bead and the dangles. 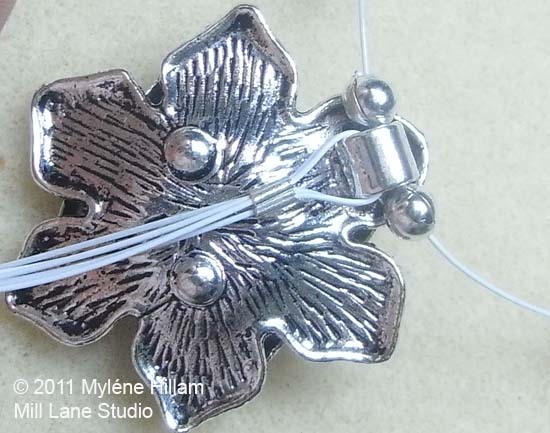 I solved the problem by joining two vine shaped connectors (very appropriate for a flower) together with jump rings so that one sits flush with the front and one sits flush on the back of the flower spacer. It's difficult to make it out in the photo below but they're connected through the hole in the centre and also on the outside edge. But this left me with a jump ring that is sitting horizontally and not vertically. 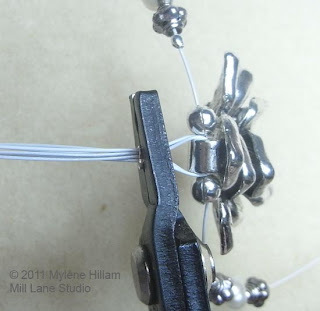 So instead of using an eyepin to connect the next section I used a head pin with a 3mm silver bead on it to act as a stopper inside the horizontal jump ring! 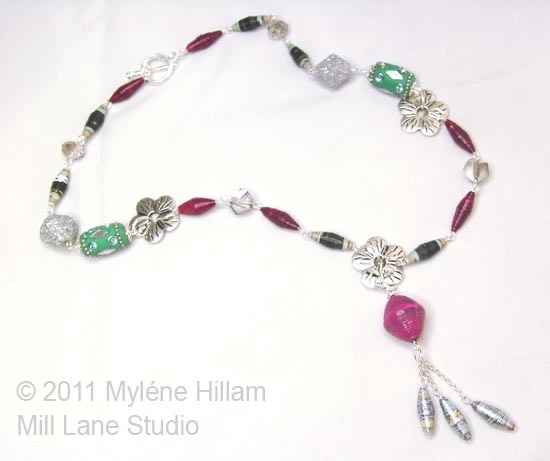 Then it was just a matter of threading on the gorgeous magenta focal bead (one of my special pick ups from CHA), turning a loop and connecting the beaded chains. So what do you think? 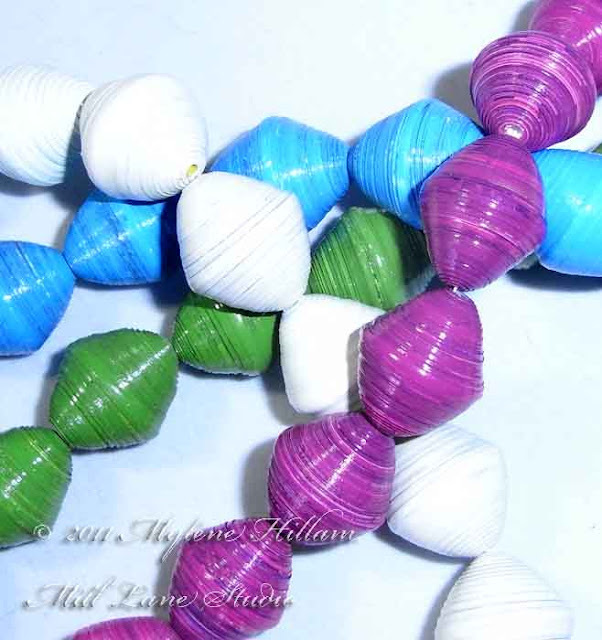 Who would have thought paper beads could look so good! So, now I have a small handful of handmade paper beads. What to do with them next? When you roll your paper beads from magazines and junk mail you really don't know how they'll look until you've rolled them. After all, the only bits that show are the very edges and they are often multi coloured but with a fair bit of black patterning. 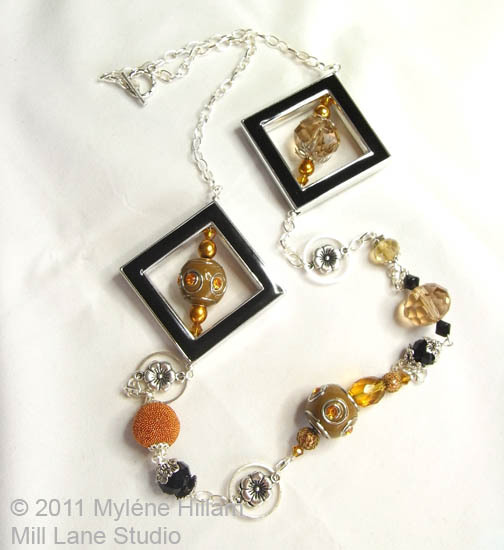 So what do you do when you don't like the colour of some of the beads? Why, you recolour them of course! I've decided to colour them up with some Sephora nail polish. This will do two things: it will brighten them up but it wall also seal them and make them durable for use in jewellery making. About the only time I get to use nail polish is when I'm on vacation. Most of the time, my hands take a fair bit of punishment because they are always in some sort of arty stuff which will either chip the nail polish, partially remove it or generally make it look untidy. So when I buy a new nail colour, it gets used for a couple of weeks and then doesn't get used again for another year. So this is going to be a "use it up" project. 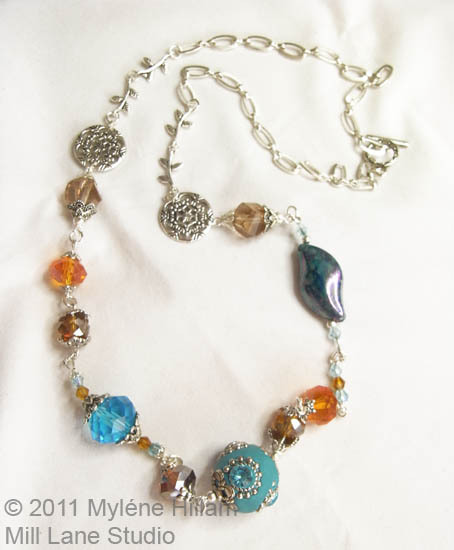 You should choose whatever colour you would LOVE to wear in a necklace! 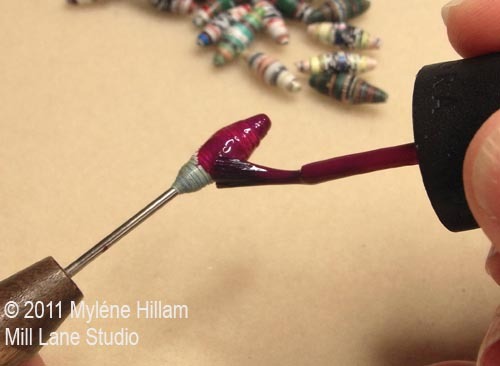 Painting the beads with nail polish is a straight forward process.... just place the bead back on the bead roller or on a needle tool and begin to paint. This gorgeous burgundy colour from Sephora went on really easily and didn't dry too quickly which meant I was able to get all the way around the bead before the leading edge had dried so you couldn't see where I'd started. 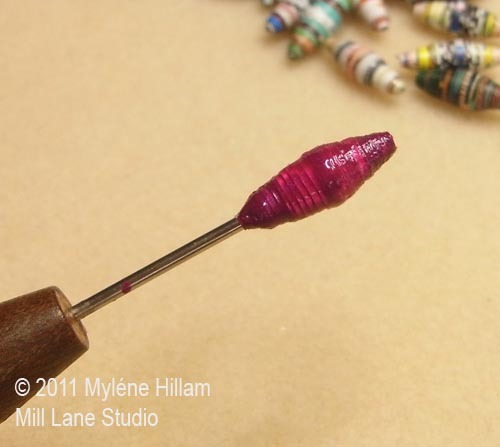 Just continue painting the bead until it's fully coloured. 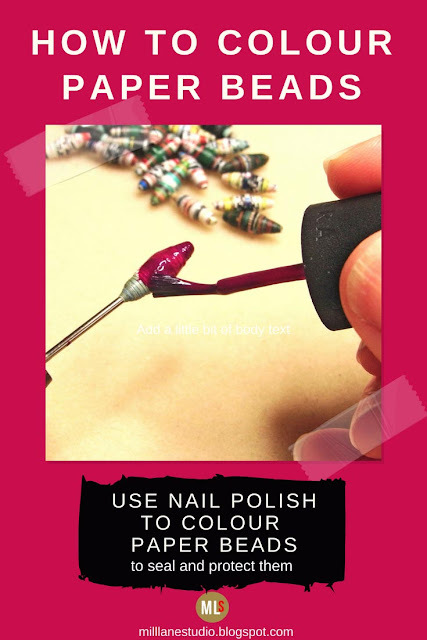 I was fairly generous with the nail varnish just as if I was painting my nails but I didn't put it on so thickly that it was dripping. After one coat they were looking a little patchy so they will definitely need a second coat. I always find it better to do thinner coats and apply a couple of layers rather than do one really thick coat. Well, so far so good. I love the colour they've turned out. 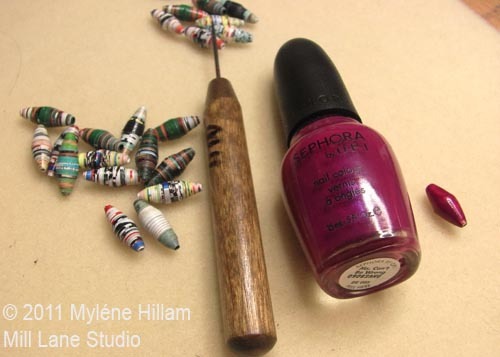 Now it's just wait and see how durable the nail polish is as a colouring medium. I'll make them up into jewellery to test them out. 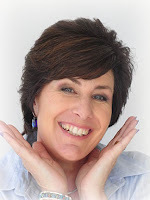 Click here to see how it turned out! Oh what fun! 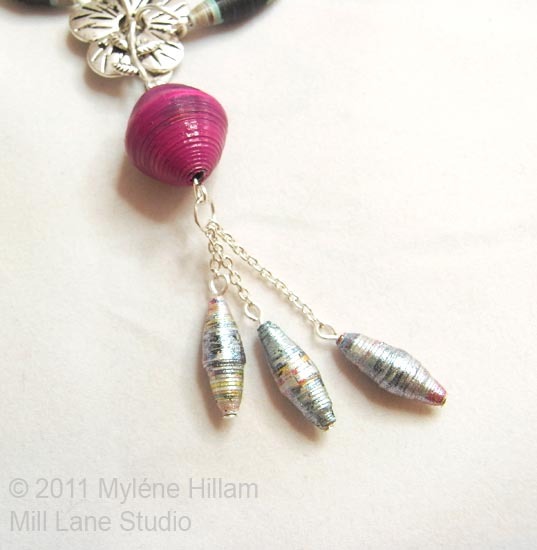 I've been playing with the paper bead rolling kit that I brought home with me from CHA earlier in the year. Those brightly coloured strands of paper beads hanging up in the booth of Aubrey's Paper Beads were so enticing that I couldn't resist temptation and I bought several strands. 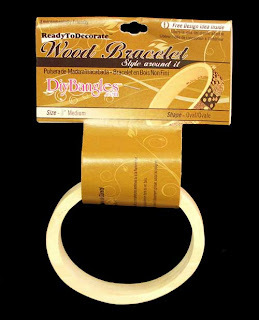 But I also bought a paper bead making kit to make my own! Buying a kit means you have everything you need to get started. 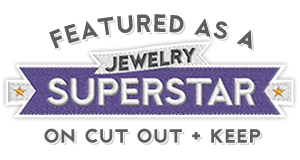 But if you prefer to use up strips of magazines and papers you already have on hand, then all you need is a bead rolling tool with a slot. This will give you really tightly formed beads and a much more professional result. One thing I discovered is that getting even beads takes a little practice. 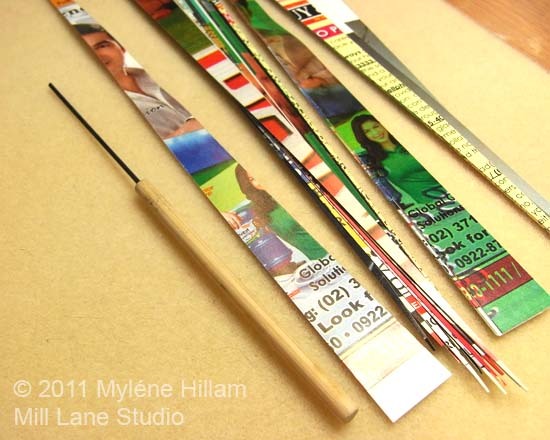 But if you roll them lopsided, you can just unravel them and re-roll the strip to make it straight. and then begin to roll. 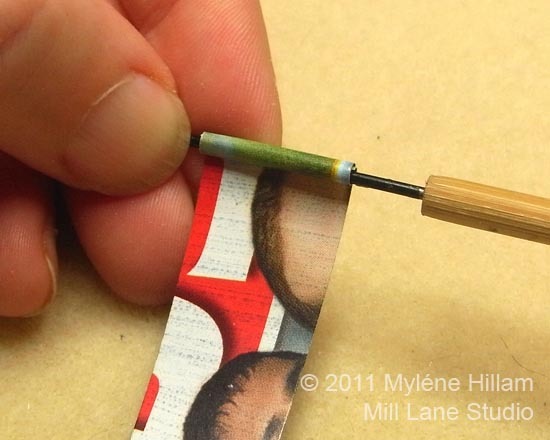 Roll as straight as you can, especially if your paper strip is tapered. You want to keep the bead as even as you can. 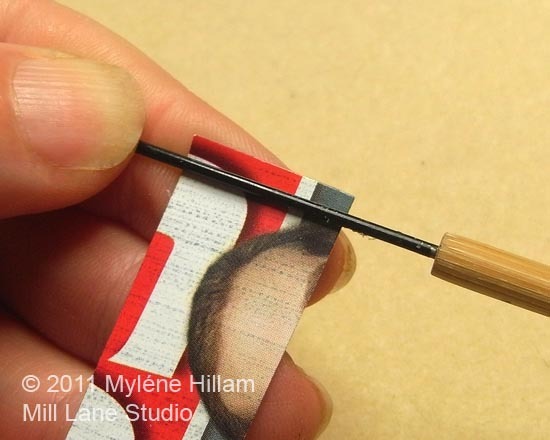 I like to add a bit of adhesive along the strip as I go. I used Mod Podge but use whatever paper adhesive you have on hand. It's a bit of a messy process but it ensures the bead won't unravel. ......and rolling, until you get to the end of the strip. Glue it in place to secure. How easy is that?!! 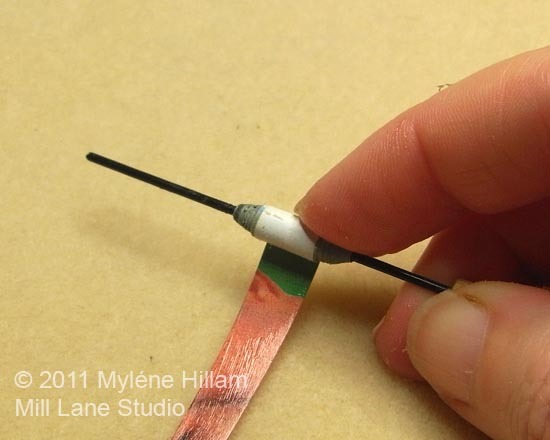 Now you can slide the bead off the tool and you're ready to make another bead. It is a strangely satisfying process - your recycling efforts are rewarded with a bunch of handmade beads ready to incorporate into your next jewellery project. Check back in tomorrow to see how I coloured them! Today I'm going to take you back in time to a bangle challenge I was set at CHA last year: decorate seven prototype, oval-shaped Diy Bangles with only the materials I had on hand in my hotel room. And the reason for the challenge? 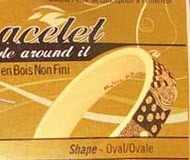 Well, it was to come up with a bangle design for the packaging of the new Diy Bangles oval shaped bangle. But in all, I designed 7 bangles and the one that Diy Bangles selected as the image design for the packaging was Zentangle Bangle! You have to look closely, but you can even see my name on the inside! 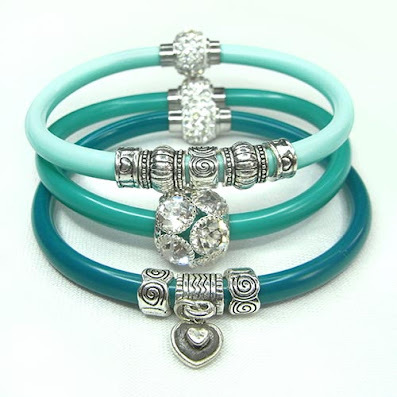 Diy Bangles are really a lot of fun to play around with and they make great personalised gifts. 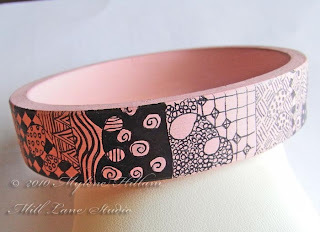 With Christmas not too far away, why not grab yourself a Diy Bangle and decorate it for someone on your Christmas list. 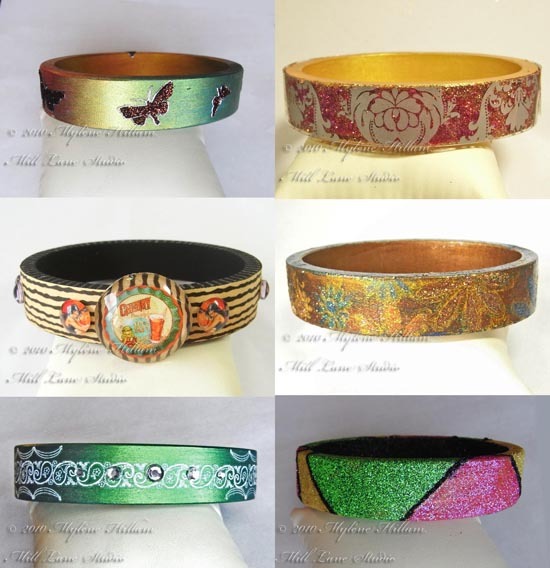 If you're stuck for ideas, check out all seven tutorials for the bangles by clicking here. I did it! I solved my little design challenge AND used up almost all the remaining beads from the four necklaces. So now I'll let you in on what the challenges were and how I solved them. 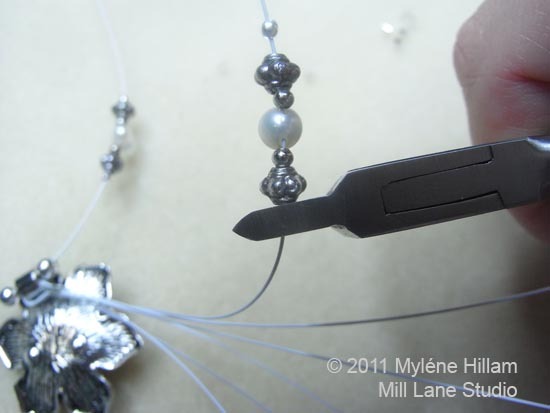 For this last piece I was planning a simple double strand floating necklace. 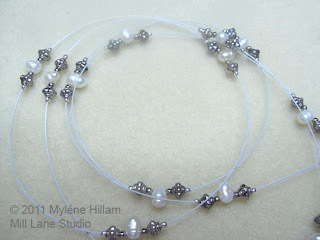 Pearls always look great when strung this way so I created a 40" length of floating beads on white tiger tail. 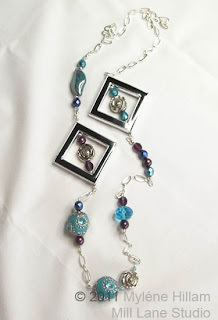 I decided to try out my magic crimping tool to turn the crimp tubes into beads so that they would match the mini silver beads from the original necklace. As I worked on it I kept thinking how crisp the white tiger tail looked against the pearls and silver spacers. It was hard work crimping those tubes into balls but it was worth the effort... it was looking really good! 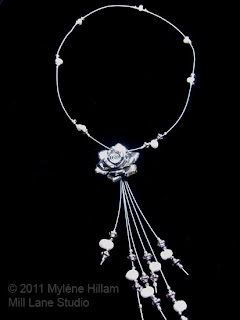 But when I tried it on I hated it: the white tiger tail made the silver beads look too dark and it had no focal point! So a rethink of the design was in order. 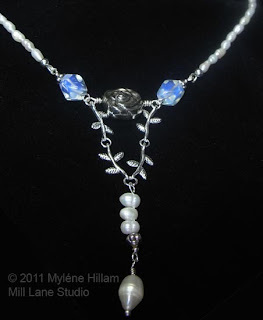 I decided to cut the length in half and make a single stranded floating necklace and add a focal with dangles. I found the perfect flower pendant which I'd bought only a couple of days ago. It has quite a large bail attached at the top of it which would have been great if it was strung on a thick stringing material but not so good for tiger tail. 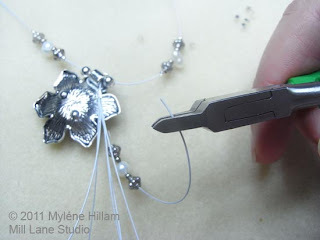 So I had to figure out how to connect my length of beaded tiger tail to the pendant without the join showing. I couldn't just string it on: the bail was big, but not big enough to slide over the beads I'd crimped onto the tiger tail. Hmmm.... a conundrum! 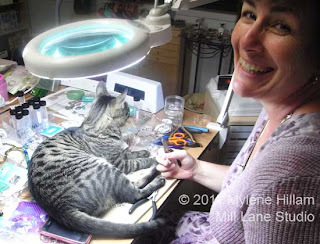 At this point I walked away from the beading table for a while. Sometimes you need to mull over a problem before you tackle it. What I needed to come up with was a neat and secure solution. 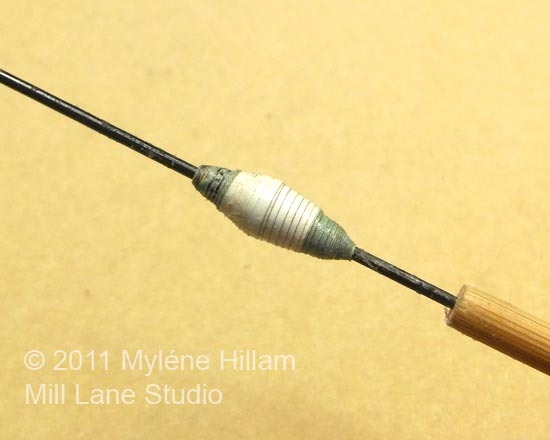 And then it came to me: thread both ends through the bail and crimp the two lengths on either side of the bail. 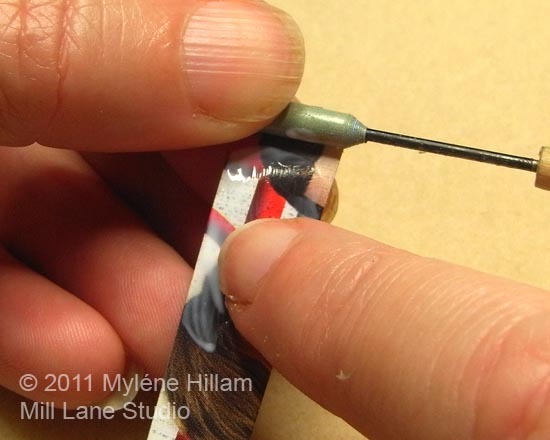 A crimp cover hides the crimps as well as securing the bail in place! 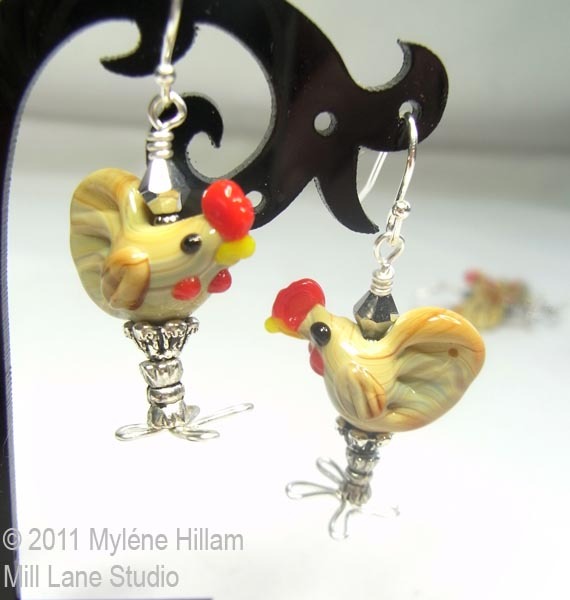 Now for the dangles. 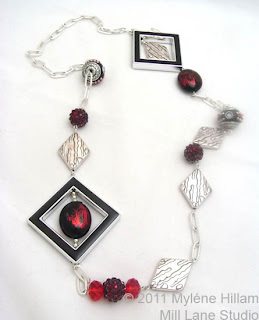 I had to cut apart the other beaded length to get this idea to work.... it was a shame to undo all that hard work - it had taken more than a couple of hours to turn all those crimp tubes into beads! But there were no more beads to use, so there was no choice. But first things first.... 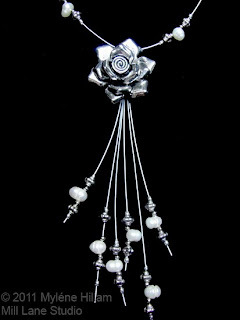 I need to secure a bunch of tiger tail dangles behind the flower so that the dangles will sit nicely. Lucky for the big bail after all! I threaded them all through the bail and crimped them with my Mighty Crimper and a No. 4 crimping tube. I don't have bead covers large enough to cover a No. 4 crimp but it still looks neat. Now for the finishing touch: the dangles. 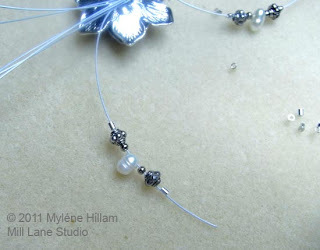 I threaded the crimps and beads on in the same pattern I used on the floating strand. 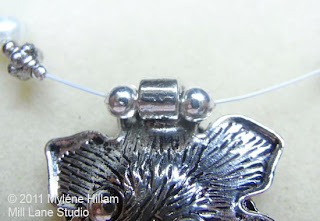 and then, right above the top bead to keep them all in place. I love the way the dangles turned out. 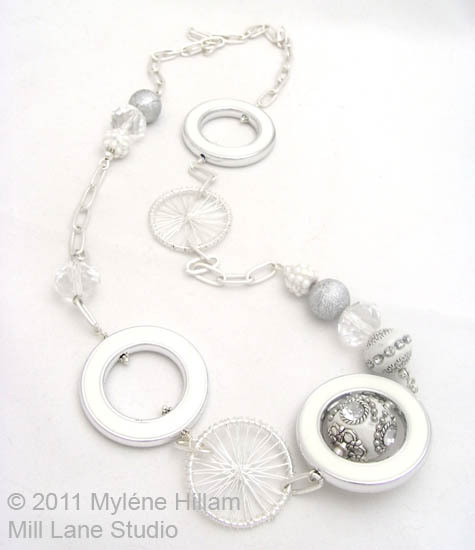 And the finished floating necklace too. This has been a great exercise to stretch my thinking laterally. Finding solutions to challenges like this is really satisfying too. And now that there are so few beads left to work with, I think I will put this collection aside. 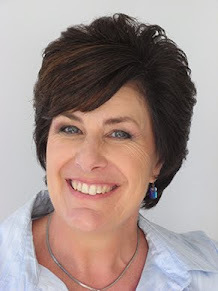 And yes, I am officially calling Moonlight and Pearls a collection now: there are 6 pairs of earrings, one bracelet and three necklaces - all coordinating, all of which can be mixed and matched to tell a story and all designed by one designer. Yes, all the boxes are now ticked.... it's a collection! At the end of my last post I hinted that there might be just one more piece of jewellery to add to the Moonlight and Pearls mini collection. You might recall that I started out on this quest with four necklace strands consisting of moonshine beads, ivory potato pearls and silver spacer beads. 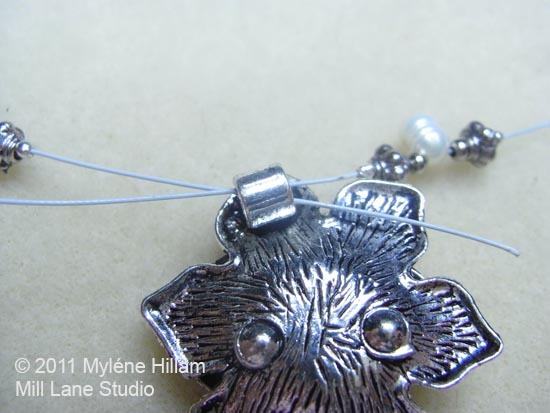 After making a double stranded necklace, 6 pairs of earrings and a bracelet/cuff, all I had left was one moonshine bead, a pearl and a small handful each of silver spacers and the mini silver balls. Well, it turns out that I can't count.... I actually had no moonshine beads left. I'm not sure how you can miscount just one bead but I did. And then I re counted the earrings and it turns out that I had actually made 7 pairs of earrings not six. The seventh pair is very similar to the ones I made for my Mum so I pulled them apart and now I have two moonshine beads to play with. Yay! So here's how I used the last couple of the focal beads. With the addition of some similar beads from my stash I've been able to make the last few beads stretch as far as possible. 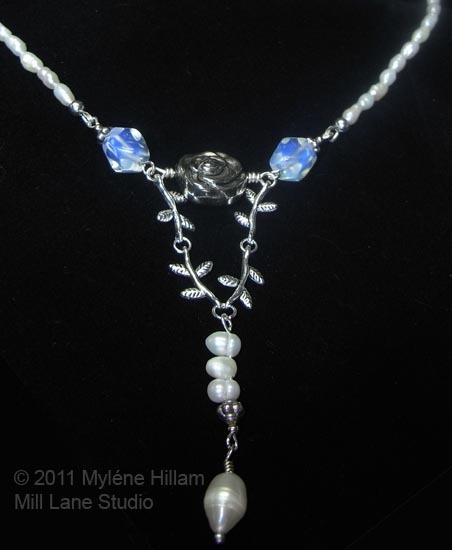 I picked up the strand of freshwater pearls from Vinnies for just $1.... what a find! It's amazing how far you can make beads go when you put your mind to it. 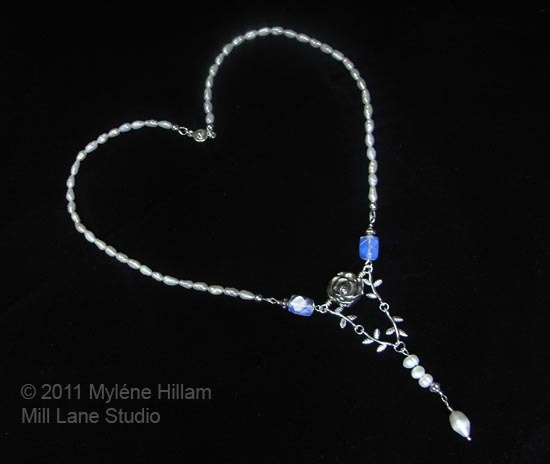 Want to see what I did with the last few silver spacers and mini silver balls? Well, I've come up with a design, but making it work is proving to be a bit of a challenge. I hope you'll check back in with me tomorrow to see how it went.